The drive for reducing UK manufacturing costs has increased the demand for robotics automation technology projects and has been our primary focus since 2006. A number of robotics automation technology projects have been successfully completed in the Midlands and in Kent using ABB 640, 4400 and 340 robots and Kawasaki ZD130 robots. These have been for pick and place, carton loading and palletising applications in the confectionery and plasterboard industries. 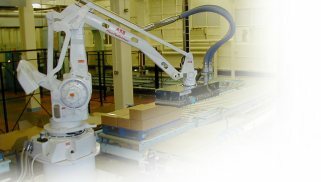 Robotics systems are specified and designed to suit the particular application. The one shown (left) uses an ABB IRB 640 palletising robot with a special purpose vacuum head. During the design stage of the project we are able to model the robot cell in 3 dimensions using Solidworks software. We can provide full system integration and bring an innovative approach to operational requirements of remote cells … for example, SMS text messages and pan and zoom camera for monitoring of alarm conditions. All robotics automation technology cells are built up and tested for customer acceptance at our works in Sittingbourne Kent, prior to installation and final commissioning on site. All mechanical design work is completed using 3D solid modelling based upon the ubiquitous Solidworks software. All electrical design work is undertaken using RS Wire.